Essential plot rundown: A group of scientists discover a shape-shifting alien. This is an extremely well made movie. I remember the first time I saw it. I was flippin through the channels one Saturday morning and stumbled upon this. And my mind was blown. Everything about this movie is good. The music is fitting and very creepy. The actors do a good job in their roles. All of the characters and their actions are believable. It creates an eerie atmosphere of distrust. (Though, some of the characters do come right out and say that nobody can be trusted). It focuses more on atmosphere, but when it does use jump scares, it uses them effectively. Really, the only downside is the last confrontation with the Thing, which is a little anti-climatic. 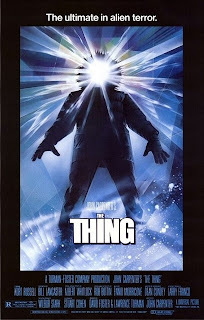 So, I watched the prequel, The Thing (2011), a couple of days ago. The prequel is about the Norwegian camp the originally discovers the alien. It does set up some nice continuity between the two films. However, they are very minor and you only notice them for the second they are on screen. Then you forget that there was even a prequel because John Carpenter's version is so awesome. However, the Thing acts differently in the two films. In the prequel, it is more bold and aggressive; while in the original, it spends most of its time hiding, only attacking when provoked. I assume the reason for that is because the directors had different visions for their films and took them in different directions. The prequel wanted to use jump scares while the original relied more on the atmosphere to create fear. And that is my honest opinion on why the Thing's behavior is different in each movie. However, I like to pretend that there is another reason. In The Thing (2011), the creature had barely woken up out of its sleep. So, it was scared and confused, causing it to act more aggressively. By the time the sequel (Is it kosher to call John Carpenter's version a "sequel"?) rolls around, it has finally calmed down and realized that it needs to hide in order to survive. To this day, I am amazed at how incredible the special effects are for this film. Every Thing, every transformation is a practical effect; no CGI. And they hold up amazing. There were only a few shots where the creature look fake. But, overall, the creature effects are awesome. These practical effects make the SFX in the prequel look like cartoons. So, overall, this is a great movie. I would recommend it to anyone who doesn't have a weak stomach. (It is a pretty graphic movie). Yea, check it out.